The issue of whether England should have its own parliament is mainly a matter for English people. But a Scottish unionist can, of course, be interested in political developments in the rest of Britain. Being both Scottish and British, whatever happens in England is a matter also for me. England, after all, is a part of my country, the UK. Moreover, whatever happens in a part of the UK tends to influence everyone else no matter where we live. Take the issue of devolution. I can remember a time when it would have been hard to find an English person who was interested in setting up an English parliament. English identity as something separate from British identity is a relatively modern phenomenon. Most English people, who I met years ago, primarily thought of themselves as a British. For this reason the English flag was rarely seen, only ever really flying over medieval churches in small villages. Thus, English people tended to conflate Britain with England in the same way that we all used to conflate Russia with the Soviet Union. They meant no offence and were baffled by our chippiness over this matter. Having a separate identity within the UK is something, that until recently, was only really felt by the Scots and the Welsh. The English did not dwell on their Englishness, while Northern Irish unionists would maintain that they were British and nationalists that they were Irish. The thing that changed all this was Scottish devolution. The Scottish Labour Party in the late 1980s, sick of Tory rule, began to think that a Scottish parliament would mean that even if a general election gave rise to a Tory government, they could still rule in Scotland. What began as a heads I win, tails you lose kind of ruse only affecting Scotland, soon influenced others who wanted the same. Scotland gained a parliament. So too did Wales and Northern Ireland. Naturally, England began to feel left out and with some justification especially as there was a perception in England that English taxes were funding largesse in Scotland, Wales and Northern Ireland. Obviously, this led to resentment as English people saw that Scots were getting things for free, which the English had to pay for, even though the tax rate in Scotland was the same as in England. English people began to count up how money was distributed within the UK and began to think that they were getting a raw deal. They thought the situation was unfair. It was unfair. Some unionists in Scotland realised that devolution would weaken the bonds of the Union and therefore opposed it. Some years later it is clear that we were right. The unfair devolution settlement is directly responsible for the rise of nationalism in Scotland, but perhaps more importantly it is responsible for the rise of something previously unknown. Resentment against the unfairness of devolution, where everyone had their own parliament except England has provided the perfect breeding ground for nationalism there. English people began to think less in terms of their Britishness and began to carve up a British identity, which previously had made no distinctions. English nationalism was a response to devolution and to the growth of nationalism in other parts of the UK. Now the English have rediscovered their flag and their resentment especially against Scotland is obvious. There are, without doubt, more people in England who favour Scottish independence than in Scotland. Something unimaginable a generation ago is commonplace today. The response of many English people to the debate about Scottish independence is to say “good riddance”. A Scottish unionist can no more be expected to be sympathetic towards English nationalism than to Scottish nationalism. It is in this context therefore, that I look at the issue of an English parliament. By setting up the Scottish parliament it seems clear that Labour opened the Pandora’s box called “nationalism” and it is this parliament which is directly responsible for the recent rise in popularity of the SNP leading to the independence referendum. Hardly anyone in Scotland, twenty or thirty years ago, considered that the breakup of Britain was even remotely possible. But now, one bad polling day for unionists could see a 300 year marriage end in divorce. The question has to be asked therefore as to whether setting up an English parliament would see nationalism increase still further in England, with perhaps a demand for English independence some years from now. If an English parliament would inevitably lead to demands for English independence, then unionists can not be expected to support the creation of such a parliament. This is so even if we recognise the unfairness of the present unequal situation. I may wish that the devolved parliaments, which created the unfairness had never happened, but I must recognise that they are not going to go away. The unfairness therefore cannot realistically be addressed by abolishing the presently existing devolved parliaments. But clearly the present situation is untenable. How then can the unfairness to England be addressed? The question of what would happen if Scotland voted to remain in the Union is being debated at present. Some politicians favour still more devolution as a reward for Scots voting to stay. But this would simply increase the unfairness of the asymmetrical devolution settlement. Scotland would get more and more devolved power, while England would get none. Given that it is this devolution of power that has given rise to Scottish nationalism, devolving still more power must inevitably give rise to another independence referendum sometime in the future. The SNP takes a long view and would embrace any step, however gradual, which led to eventual independence. Scots must accept that if we we vote “no” to independence, we are voting “yes” to the Union. We will be renewing our marriage vows and therefore, in choosing to remain in Britain, we must logically choose whatever is in the interest of Britain as a whole. Thus demanding something that would be inconsistent with the Union continuing, i.e. 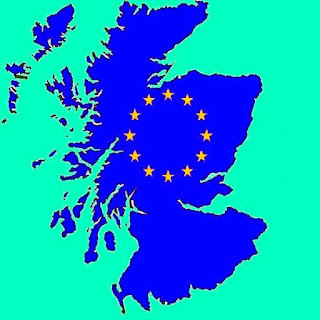 ever more power for the Scottish parliament, would be to contradict our choice of remaining in the Union. Scotland should therefore not demand any more power until the devolution settlement is made fairer to England. There are a number of ways of devolving power to England. A separate parliament could be set up, perhaps in a northern city like Manchester or York. Alternatively, Westminster could be run such that on certain days only English MPs sat. The key issue is how would all of this affect the UK government? Imagine if the UK government was run by Labour, but the English parliament was run by the Conservatives. Would this not be a recipe for gridlock? On the other hand, if both parliaments were run by one party, there would be the danger that what was now done by one parliament, would subsequently require two. This would be grossly inefficient and expensive in a time when we are all in the greatest of economic difficulties. They key to the whole problem is that the issue of devolution must be addressed in a UK context. The federal model of devolved power, which exists in a country like Germany is both fair to everyone and consistent with maintaining the union of the various Länder. It does not give rise to nationalism or separatism, which is practically unknown in Germany. Something along these lines could be tried in the UK. The biggest problem is that the size and population of England would tend to dominate both the other parts of the UK and the national or federal government. An alternative form of devolution, whereby the devolving of power went still further to a much more local level might be both more democratic and less likely to give rise to nationalistic rivalry or dominance. If Aberdeenshire, Armagh, Clwyd and Buckinghamshire and every other region each had the same degree of real local power, then devolution would be equal throughout the UK, even if England did not have its own parliament. Such a parliament would be unnecessary as power would have already largely bypassed the devolved parliaments in the other parts of the UK. England should have its own parliament if the people of England want one. No Scot should try to deny to a fellow countryman what he has himself been given. This is a matter for the English to decide. But practically speaking, an English parliament is only going to happen if the setting up of such a parliament becomes the policy of one of the major parties and that party wins a general election and introduces a bill to create a parliament for England. The reality, with a referendum on the EU likely to dominate the next few years, is that it is highly unlikely that such a parliament will happen any time soon. However, real power could still be devolved if Westminster, Holyrood, Stormont and the Welsh Assembly were willing to give up some of their power and devolve it still further to the people living in the various counties of the UK. This would not satisfy nationalists, but it would increase the fairness of the devolution settlement, which is vital if we are to remain a United Kingdom.